MSI rolled out the 760GMA-P34FX, a cost-effective socket AM3+ motherboard in the micro-ATX form-factor, designed with out of the box support for AMD FX "Vishera" processors. Based on the dated AMD 760 chipset with SB710 southbridge, the motherboard still offers modern connectivity, such as SATA 6 Gb/s and USB 3.0, but using third-party controllers. Drawing power from a combination of 24-pin ATX and 4-pin CPU power connectors, the 760GMA-P34FX offers two DDR3 DIMM slots, supporting up to 16 GB of dual-channel DDR3 memory. A PCI-Express 2.0 x16, a PCI-Express 2.0 x1, and a legacy PCI slot make up its expansion area. Storage connectivity includes six SATA 3 Gb/s ports (from the SB710 southbridge), and two SATA 6 Gb/s ports (from an ASMedia ASM1061 controller). Display connectivity includes one each of DVI and D-Sub. The board offers four USB 3.0 ports, two on the rear panel, two by headers. 6-channel HD audio, and gigabit Ethernet make for the rest of the connectivity. Expect this one to be light on your wallet. Really light. GIGABYTE today announced official support for next generation AMD A-Series APUs based on the highly anticipated 'Kaveri' architecture. GIGABYTE 'Kaveri' support includes current AMD A88X and A55 (rev3.0) platform motherboards plus forthcoming A78 platform motherboards. "By enabling support on current GIGABYTE AMD motherboards for these new AMD A-Series APUs, GIGABYTE ensures our customers are able to take advantage of a whole new approach to PC architecture design," commented Henry Kao, Vice President of GIGABYTE Motherboard Business Unit. 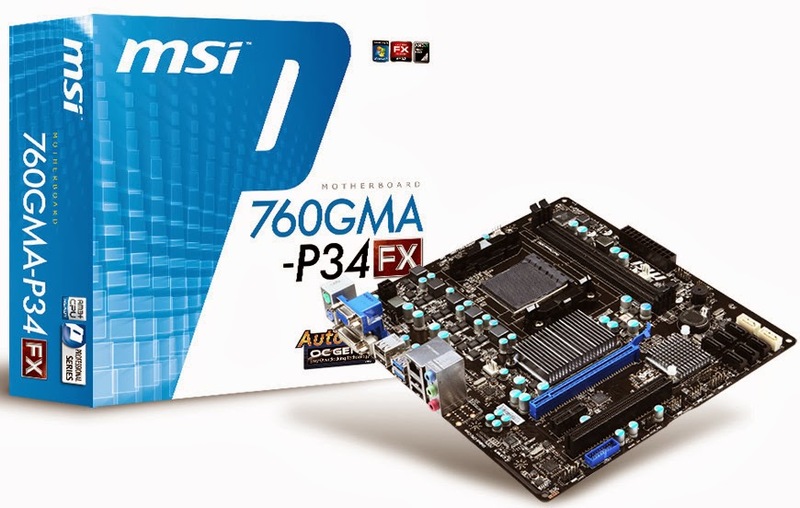 "Combining the highest level of quality design with the most advanced set of features, GIGABYTE FM2+ motherboards offer the best user experience for these new A-Series APUs." "These FM2+ Series motherboards from GIGABYTE are the ultimate showcase for our new A-Series APUs," said Bernd Lienhard, corporate vice president and general manager, Client Business Unit, AMD. "In collaboration with GIGABYTE, AMD is proud to enable a truly optimized user experience in terms of raw compute performance while creating an industry-leading visual and audio experience with the latest generation of our APUs." The latest AMD A10-7850K and A10-7700K APUs integrate an enhanced CPU core based on the 'Steamroller' architecture with a new and updated Radeon Graphics core. Supporting native 8 GT/s PCI Express gen 3.0 and DX11.1 graphics, these new AMD A-Series APUs also offer native support for 4K resolution displays on HDMI and DisplayPort. Maintained by the HSA Foundation, HSA is a system architecture that allows accelerators such as the graphics processor (GPU) to operate at the same processing level as the system's CPU, providing up to 50 per cent more GPU performance and up to 20 per cent more x86 instructions executed per cycle compared to previous implementations. The new AMD A10 series APUs are the first desktop PC processors to implement the performance advantages of HSA. KINGMAX launched the latest OTG USB Flash Drive, PJ-02, for desktops, notebooks, smartphones, tablets, etc. The PJ-02 has dual transfer interfaces, standard USB and micro USB, to fit devices. KINGMAX emphasizing the portable device market, so they launched two OTG new products in a short while. The PJ-02 is an OTG USB with high compatibility. You can use it to read data in your smartphone or tablet, and plug it to desktops and notebooks as a storage device. It supports OTG (On-The-Go) function with micro USB, and the other side is standard USB. You can store music files easier, share data friendly, and save documents free. The PJ-02 reads and edits files with high speed. There are three kinds of capacity for options, 8GB, 16GB, and 32GB. 20 grams only. The PJ-02 with standard USB and micro USB is fit for desktops, notebooks, smartphones, tablets, etc. Plug and play with high compatibility. Read and write with high speed. Sharing files even easier anytime and anywhere. The size of PJ-02 is only 30.7x 12×4.5 mm, and 20 grams weight only. There is slip-proof design with four salient points, and can push it into devices easier. To protect the micro USB, there is a cover with a strap hole, users can hang PJ-02 on any place you like.